Dell Diamond Loaded with Free, Family-Friendly Activities from 10 a.m. - 2 p.m. ROUND ROCK, Texas - Baseball is back in Central Texas! 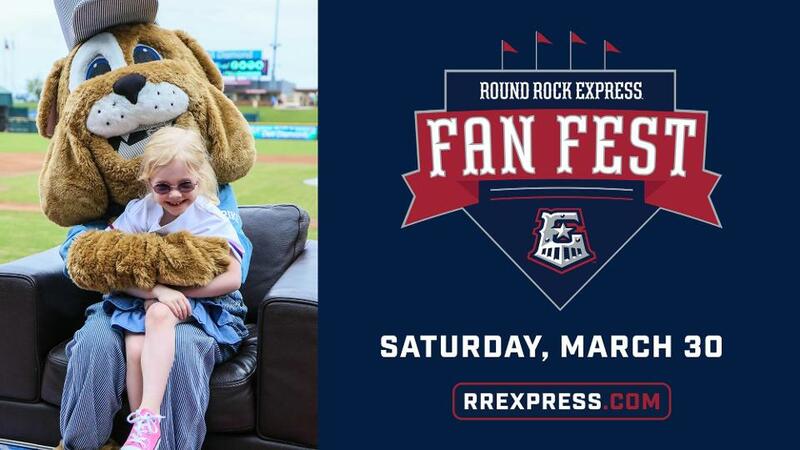 The Round Rock Express are proud to kick off the start of their historic 20th anniversary season with Fan Fest at Dell Diamond on Saturday, March 30 from 10 a.m. - 2 p.m. The stadium will be full of free, family-friendly activities for fans of all ages during the event. Express Fan Fest is free of charge and open to the public. The annual celebration of America's pastime allows fans to get back into the baseball spirit by enjoying a day full of entertainment. Fans attending this year's Fan Fest will receive an extra-special treat as the event will serve as the public debut for Home Run Dugout, a state-of-the-art sports bar and restaurant facility along the concourse in center field that offers competitive baseball and softball games for fans of all ages. While Home Run Dugout will be open for fans to preview and demo during Express Fan Fest, reservations will be required once the season begins. Attendees will also have the opportunity to throw heat in the Express home bullpen, take some hacks in the team's batting cages and participate in a hot dog eating contest. Craft beer samples will also be available in the Beer Garden, thanks to Brown Distributing. The Railyard Team Store will be filled to the brim with 2019 Round Rock Express merchandise as well as a selection of new Houston Astros gear. While at the stadium, fans can scope out the exact seat location for their season membership with available packages including Full Season and Fireworks mini-plans. Fans can get a first-hand look at the brand new seats that were installed at Dell Diamond during the offseason. Registration for the Express Kids Club will also take place, along with great specials and giveaways throughout the ballpark. Single game tickets will be on sale during Fan Fest at the ticket office and online at RRExpress.com. Batting Practice (10:30 a.m. - 2 p.m.): Separate from Home Run Dugout, fans are invited into the team's indoor batting cages to take a few swings. The Express will provide helmets and bats. Each fan will receive three (3) pitches. The line will be cut off at 1:30 p.m.
Beer Tasting (11 a.m. - 2 p.m.): Brown Distributing will be providing craft beer tasting in the Beer Garden, located in the left field corner. Ben Hur Shriner's Carnival: The west parking lot will host the Ben Hur Shriner's Carnival. Bullpen Pitching: Think you can throw some heat? Toe the rubber like the pros and toss a few pitches in the Express home bullpen! Pitchers will be limited to three (3) throws. Caricature Artist: Be on the lookout for a caricature artist on the concourse! Express Fun Zone: Portions of the Express Fun Zone will be open, including the rock climbing wall and bungee jump. Express Kids Club Sign-Up: Calling all kids! Take Mom and Dad to sign you up for the Kids Club behind home plate. Home Run Dugout: Be the first to check out the brand new, state-of-the-art Home Run Dugout along the concourse in center field. Fans will be invited to preview Home Run Dugout, but remember, reservations will be required once the season begins. Hot Dog Eating Contest: Open to all fans 18 and older, the competition will take place at noon. Fans can sign up ahead of time online. Individual Game Tickets: Tickets to individual games will be available for purchase during Fan Fest at the Dell Diamond ticket office and online at RRExpress.com. Petting Zoo and Pony Rides: The picnic area above right field will transform in to a petting zoo filled with a variety of Spike's favorite four-legged friends, along with pony rides for kids. Railyard Team Store: Stop by the Railyard Team Store to get your hands on 2019 Express merchandise as well as a new selection of Houston Astros gear. Round the Rock Camp Fair: Stop in the United Heritage Center and check out all the great youth camp options available to you and your kids right here in Central Texas! Interested in reserving a table for your camp? Please complete our Summer Camp Guide & Fair Registration Form. Season Memberships: Available season membership seats will be tagged with flags highlighting Full Season and Fireworks mini-plans. Sock Hop Inflatables: Hop around the concourse with a variety of inflatables thanks to Sock Hop! The Mustang Owners of Austin Charity Car Show: Come check out some of the coolest rides around in the suite parking lot (adjacent to Hwy 79). Scavenger Hunt: Fans can embark on a self-guided tour of various areas of Dell Diamond to receive a Be Our Guest Card, good for two reserved-seat tickets for a regular-season Sunday-Thursday home game. Train Rides: Take a ride on the E-Train! Free train rides will be available outside the United Heritage Center in the right field corner.